I recently moved to San Francisco (well almost 2 years ago) and my new favorite hobby is walking. Walking is the best way to get to know a new city, especially one as walkable as San Francisco. In a matter of minutes it can feel like you are in a totally different world. Today I decided to gather some girlfriends and walk the Marina Green. This is the beautiful path that follows the northern coastline of the city. On a clear day there are views of Alcatraz, the Golden Gate Bridge, the majestic bay, and Tiburon. It was quite a windy day so I popped on a newly made knit cap. This was a quick project using #4 weight black acrylic yarn. I chose a diagonal eyelet pattern, which finished really nicely. I am a fan of acrylics when knitting hats because they don’t get as scratchy as wool does. Overall, I think this cap is going to get a lot of wear as San Francisco is notorious for kooky weather. I have officially entered into the point of life where others have decided to procreate. This is a good and bad thing. Good for my pile of knitting scraps, bad for my social life. No longer are the days when we can go straight from work to happy hour without having to think about whose turn it is watching the little ones. Don’t get me wrong I enjoy children very much. They are cute and cuddly and when they get old enough they say some awfully funny things. 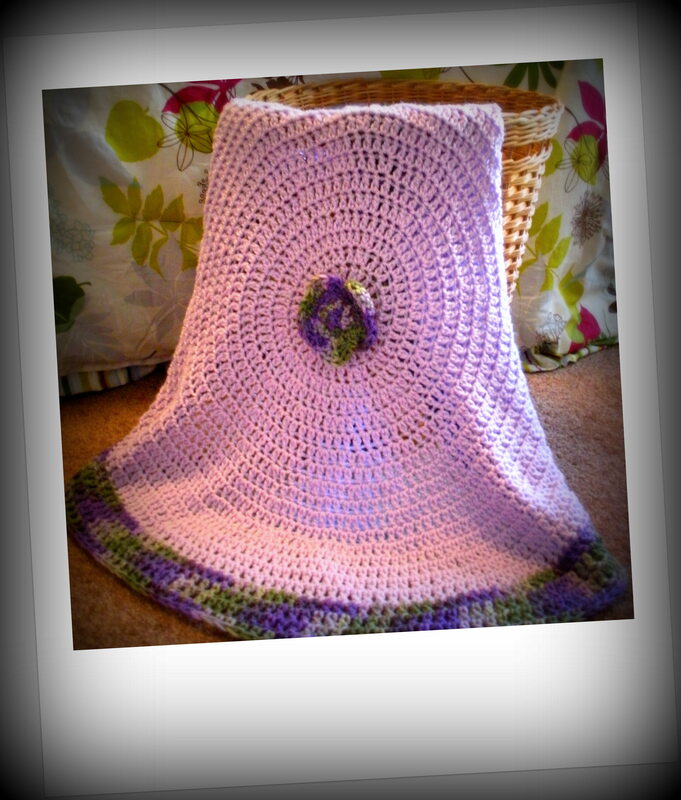 This blanket is a simple crochet pattern of double crochet and triple crochet. 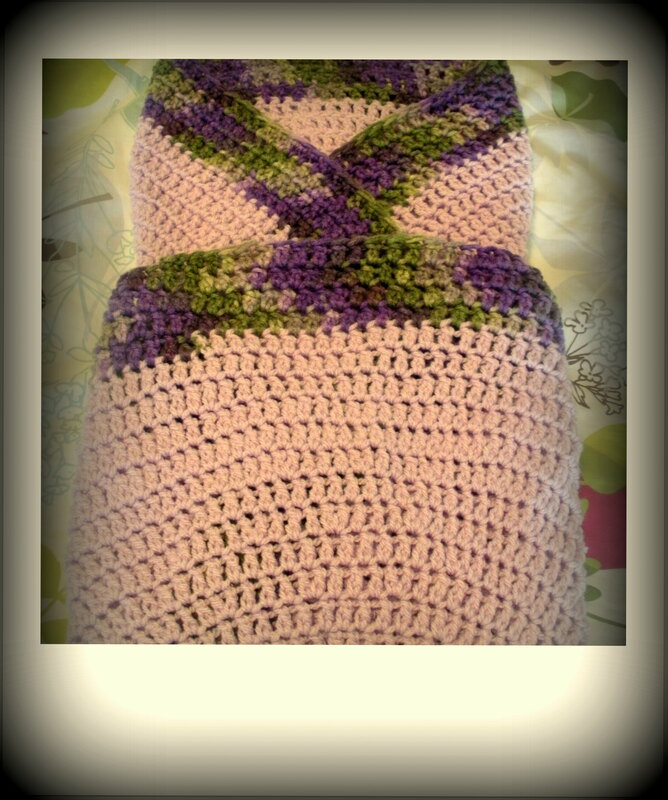 The inside is a basic lilac and the outer edge is a variegated pattern with lilac, hunter green, light green and deep purple. 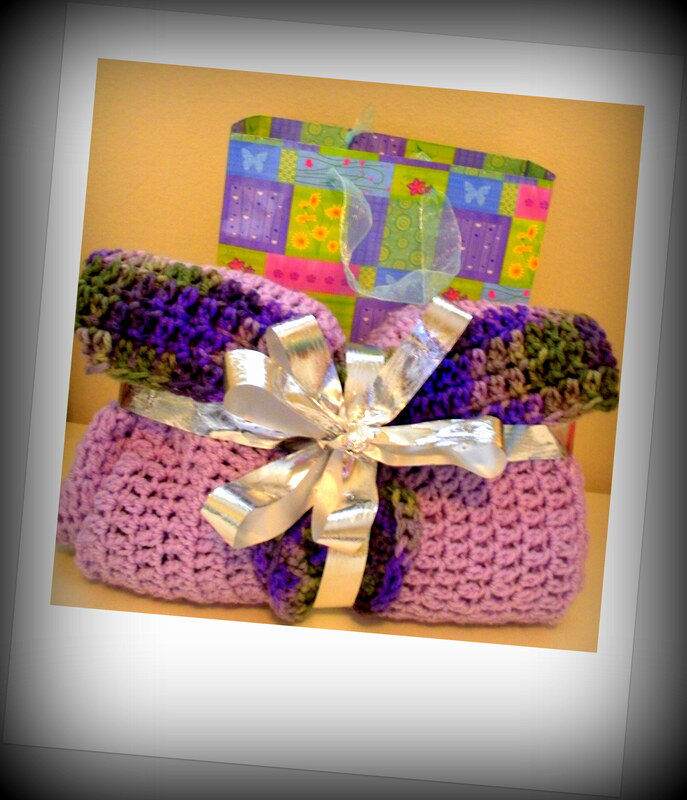 Let me add a disclaimer that I am by no means a “crocheter”. The evolution of this blanket came from the fact that I can not crochet in a square shape. So TADA! No longer do blankets have to be square! I love this design for 2 major reasons. 1) It is so simple to make. Here is how you fold to “burrito” your baby. It is just like at Chipotle! Fold both edges inward and then flip the bottom toward the top. Wrap it up and deliver. Expect a happy mommy and baby. Mission Accomplished!